East Bay Regional Park District is in the process of selecting the projects that will be funded by the renewal of Measure CC, the parcel tax that has funded park improvements. Measure CC will be on the ballot for renewal in November 2018 and will provide funding for “park improvements” for the next 15 years. YOU can have some say about those projects by making your suggestions to the park district by the end of December. Send your suggestions to publicinformation@ebparks.com. The original parcel tax was passed in 2004. Over 22% of the money raised by that parcel tax was used to destroy healthy non-native trees in the parks. Meanwhile, many of our native trees, most notably our Coast Live Oaks, are dying of Sudden Oak Death. Destroying our non-native trees, while our native trees are dying, predicts a treeless future for the Bay Area. Since dead trees are more flammable than living trees, destroying living trees while leaving dead trees in the parks means that fire hazards are being increased. We published a letter from a park advocate about Sudden Oak Death to the park district recently, which is available HERE. Today we are publishing an update from the park advocate who has learned more about the dead oak trees in East Bay parks. 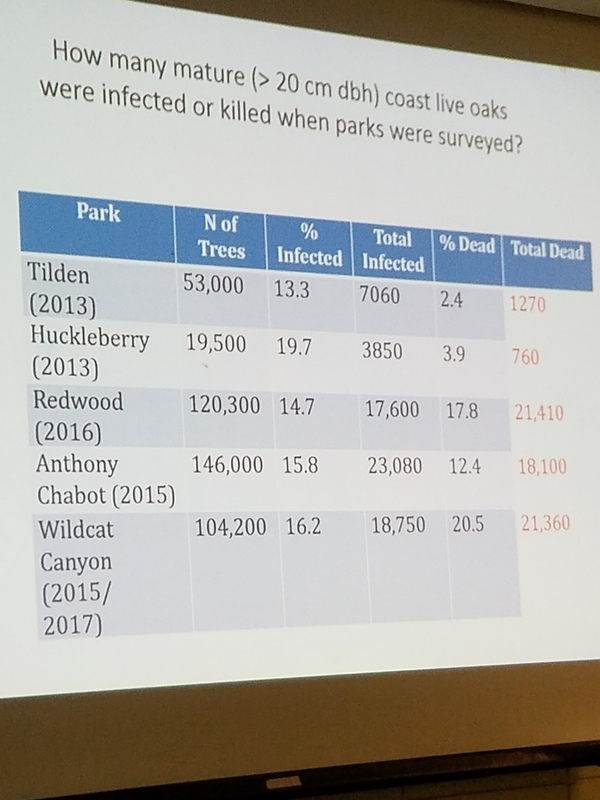 A scientist who is studying Sudden Oak Death in East Bay parks tells us that there are tens of thousands of dead oak trees in the parks and that the park district is not removing them. The dead trees are now fuel for fires in the parks. It’s been a rough year and we are sorry to end it with this unhappy news about trees in the East Bay. We send you our best wishes for a better year in 2018. Thank you for your readership. I attended the presentation of Brice McPherson to San Francisco IPM Technical Advisory Committee about Sudden Oak Death (SOD) on Thursday, December 7th. Mr. McPherson is Associate Specialist in “Organisms & the Environment” at UC Berkeley. He has been studying SOD since 2000 and more recently has inventoried the trajectory of the disease in 5 EBRPD parks and conducted experiments in those parks, with the park district’s permission. Mr. McPherson began his study of SOD in Marin County, where SOD infections were first seen in 1994, before beginning his research in East Bay parks. Comparing the progression of the disease from Marin County to the East Bay has enabled Mr. McPherson to project the future of SOD in the East Bay. Wildcat Canyon is the park in which Mr. McPherson has inventoried infected and dead trees most recently. 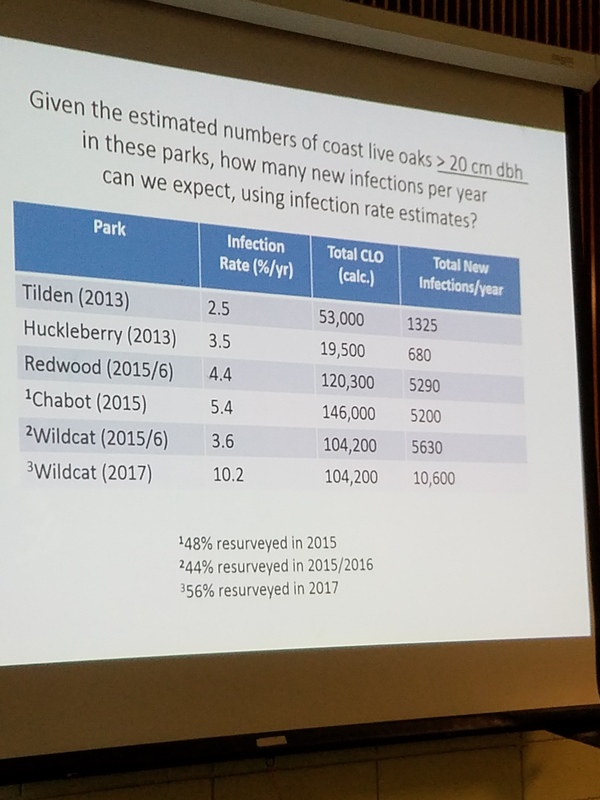 In 2017, Mr. McPherson found that 16.2% of coast live oaks were infected and 20.5% were dead. The number of dead and dying oaks in Wildcat Canyon is staggering: 18,750 oaks are infected and 21,360 oaks are dead. The number of dead and dying trees in the other 4 East Bay parks that Mr. McPherson is studying is smaller. However, his inventories in those parks are much older. Since SOD infections have increased exponentially in 2016 and 2017, we should assume that his data underestimate the current status of oaks in those parks. As you probably know, the pathogen that causes SOD is spread by rain and wind. For that reason, the rate of SOD infections has soared during the past two wet winters. Mr. McPherson predicts that the infection rate in Wildcat Canyon will increase 10.2% per year in the future, causing 10,600 new infections per year. 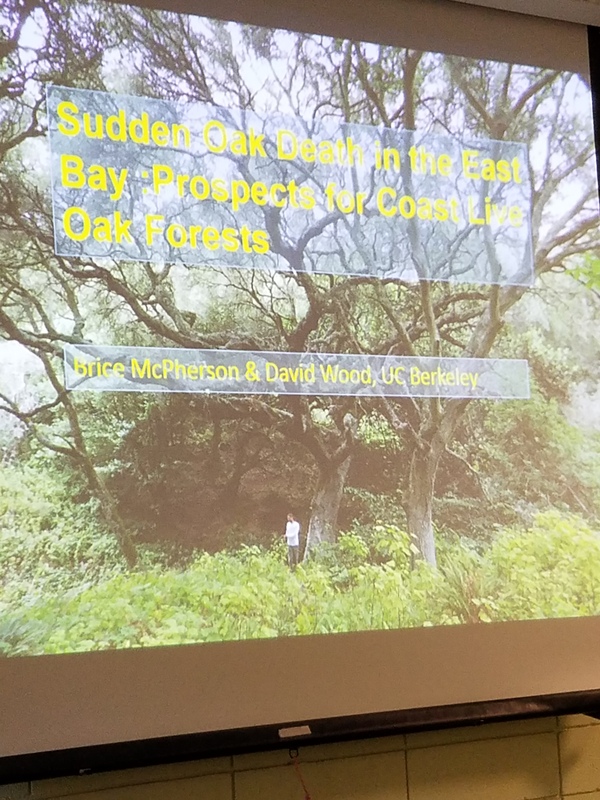 Mr. McPherson predicts that +/- 50% of all coast live oaks will be lost in East Bay parks in the next 20 years, resulting in “major changes in stand structure.” In other words, most oak forests will be replaced by other vegetation types. In response to a question, Mr. McPherson said that the park district is not doing anything about the dead oak trees because there are not sufficient funds available to remove the dead trees. He was also asked how the dead wood can be removed without spreading the infection and/or creating piles of dead fuel throughout the parks. He could not answer that question. As you know, the park district has spent about $22 million dollars destroying healthy, living trees in the parks with Measure CC funding. If the park district has the money to destroy living trees based on the claim that it will reduce fire hazards, it obviously has the money to remove dead fuel in the parks. Finally, we learned from Mr. McPherson that the park district does not employ a single certified arborist or forester. Given the resources the park district devotes to native plant “restorations” and spraying pesticides, surely it can also employ someone who knows something about trees. The landscape in the East Bay is undergoing a radical change to species that are adapted to current climate conditions that, sadly, will replace our beautiful oak forests. We need the guidance of qualified arborists to identify the most hazardous trees and make the transition to a new landscape. The employment of such expertise about trees would be a worthy expenditure of new Measure CC funding. This is a brilliant summary and letter. Thank you so much. I wish everyone who votes, cares about trees, our parks, etc, would read it. It makes it so much clearer to see the numbers for each park, and so we can also predict how bad it will be in the future. So, either the nativist fanatics get their way of having highly flammable desolate grasslands empty of wildlife where we once had trees and parks, or people realize we need every tree we can get. And this is not just to have parks, but for our air and to prevent increasing desertification of the Bay Area. The safest way to save our wildlife and parks, is to STOP KILLING TREES and STOP POISONING our earth, air, and water. And then plant, encourage, and support the re-forestation of our parks and open spaces with the trees the most suited to our changing climate, which are durable, healthy natives, like the magnificent Douglas Fir (who makes Mt. Tamalpais so magical), the Monterey Pine and other native pines, the native deciduous trees like Sycamores and Maples, and then the beautiful Australian trees, like Acacia species, Eucalyptus, etc. (The Bottlebrush, never considered for park plantings helps hummingbirds and other small birds tremendously.) Why not go wild with checking out Botanical Gardens to see what other species could be added since diversifying is the best way to deal with a tree plague? In spite of the propaganda about Eucalyptus making a mono-culture, that is not at all what they do when not planted en masse. If anyone wants to see, I can show how a few Eucs live among native forest with no encroachment, and those are where the bird diversity is most extreme.